In this short review I describe the Yongnuo RF603ii from the technical point of view focusing mainly on two topics difficult to test without specialised equipment: the trigger lag and the power consumption of the devices. 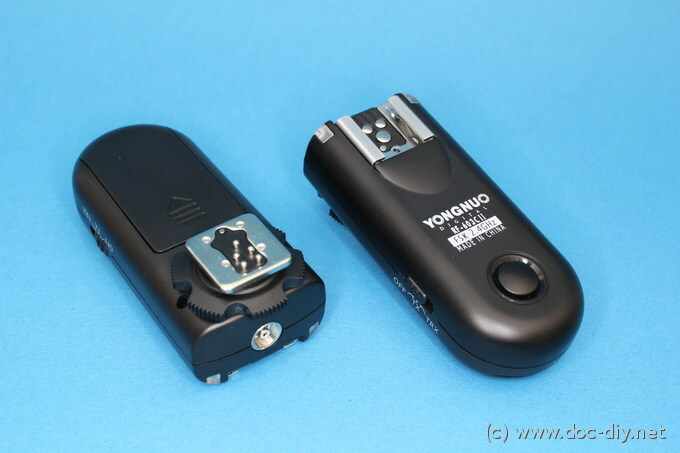 The Yongnuo RF603 ii radio remote release became quite popular under photographers recently. It offers all the amateur needs at a reasonable price. It has various connection options like the flash hot shoe, a 2.5mm jack connector and the PC sync plug. It uses standard AAA batteries in it's mk2 version. Something really great is the possibility to trigger Yongnuo's YN560-iii flash unit directly. None of the big camera manufacturers came up with this simple idea. They prefer to use their master-slave pre-flesh communication and hide this feature in less expensive camera models. Each device can operate a sender or a receiver. This is practical, but leads also to non-intuitive handling. To trigger a camera over the jack cable both devices must be in receiver (or transmitter mode, TRX) mode, not sender/receiver. Once figured out, the function is very reliable. After receiving my pair of the RF603s I was wondering how fast the communication between the sender and receiver happens. I wanted to figure out how big the delay between triggering the sender and releasing the camera or flash connected to the receiver is. Is this radio remote release useful for high-speed photography, for example in connection with the SmaTrig? 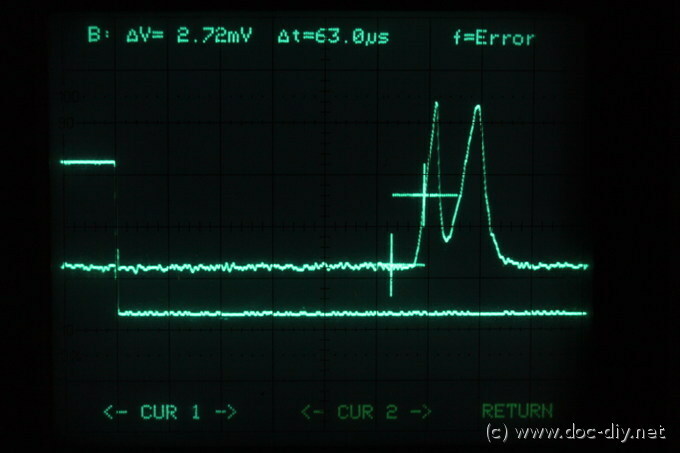 To clarify this question I have connected the sender to the SmaTrig running in interval mode (1 s interval) and the receiver to the oscilloscope. In the image below you see the result. It's an overlay of a series of multiple trigger events. The curve going down first is the sender trigger signal, the one going down later is the receiver response. It's easy to interpret the image. The trigger lag varies randomly with each release quite significantly. It ranges between about 450 us and 580 us. For the non-engineers, this equals to 0.45-0.58 ms or 1/2222 - 1/1724 s.
This result is OK for "normal" flash photography with about 1/250 s shortest exposure time. For high speed photography the delay might be too long depending on the particular application. Drop photography should work fine, flying bullets will not be captured correctly. A little bit worrying is the significant variation of the delay of about 20%. This fact can make the results quite random. Changing the channel did not have any influence on the timing. The question now is, what happens when multiple receivers receive the same signal from one sender. Will they all have the same delay? Is the trigger lag random form shot to shot but equal for all receivers? Or is it random from shot to shot and for each receiver? To figure this out I have wired up a simple setup using two receivers. One was the second RF603ii from the set driving a Speedlite 430EX, the other one was the Yongnuo YN560-III flash which has a built-in receiver compatible with the RF603ii. 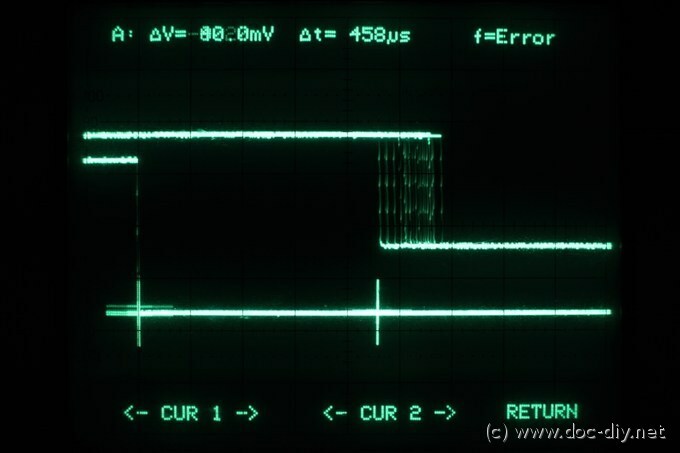 After each release both flashes fired on a fast photo diode connected to the oscilloscope. The scope was triggered with the sender release pulse. An exemplary result of the test is shown in the image below. The falling edge on the left is the sender trigger pulse. The two peaks on the right stand for the two light signals from both flash units set to 1/64 and 1/128 output power respectively. Unfortunately the peaks were at a different location for each release and overlapped only randomly. It seams, the trigger lag measured for a single remote control above varies for each device. This is of course bad news for people doing high-speed photography. The time difference might result in ghost images when multiple flashes are connected remotely. For "static" imaging the 50-100 us flash-to-flash mismatch will not be visible. In case the flashes are running at a higher power the trigger lag variation will be anyway much shorter than the total flash duration. Measurements of the flash duration depending on the power setting can be found here. To calculate the battery life of the RF603ii I simply measured the battery current for both the sender and the transmitter mode. The results are listed below. The difference between the modes is significant. The explanation is simple: the sender wakes up just on demand, the receiver must be awake all time. A battery life of two days should be no limit for spontaneous shooting, but might be critical for long time installations like photo traps in nature observation. When the remotes are used randomly as sender or receiver the battery life should be equal for each device in the pair. In the following you'll see how the RF603ii looks inside. 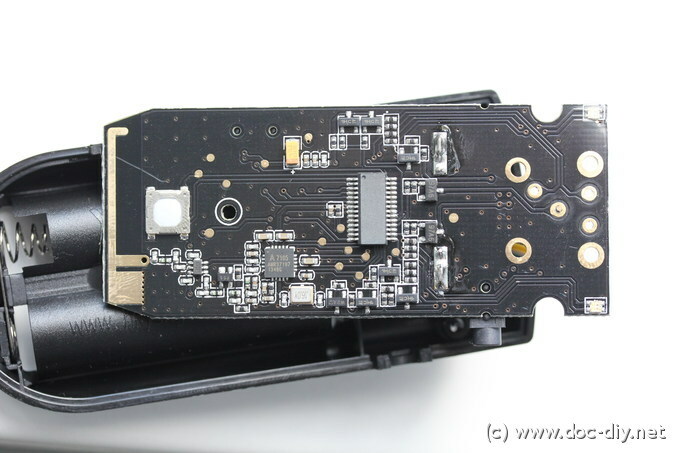 Most components are mounted on the top side of the PCB (facing the top conver) which is accessible after desoldering the pins of the top hot shoe. This is not trivial with the two-sided PCB. The flash output seems to be triggered with the MAC97A6 logic level triac capable of switching up to 400 V. The MMBT8050 NPN transistors seem to switch the camera outputs. During experiments I noticed the PC sync output doesn't trigger some camera models. The inner resistance of the triac is probably too high. 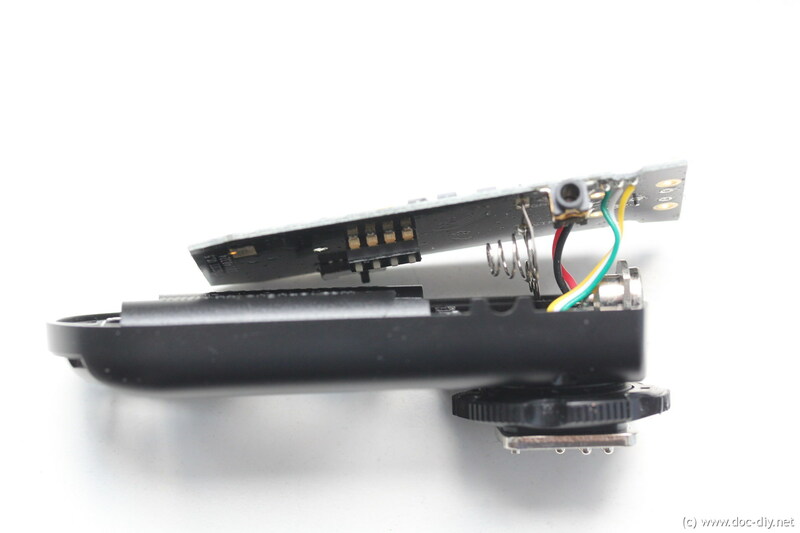 Could you actuate the shutter release via the 2.5 jack with a custom cable? External battery through the 2.5mm remote port? I have experience exactly what you have measured. In wild life camera trap use, the batteries of the 602 II have to be changed every 2:nd day. Wired the system stays up for at least a week. Is there a way to supply 3V DC through the 2.5mm remote port? I have seen such a solution on you tube but i do not know if the remotes were modified in some way. Thank you for this review, very interesting. During reading about the trigger lag with multiple receivers I have noticed that the two flashes are triggered in two different ways. Could it be possible that there is a different lag inside the flashes itself? Possible process: YN560 and YN RF receive the signal at the same time. YN 560 recognizes the signal and *FLASH*. Meanwhile the YN603 also recognized the signal and sends a trigger signal to the 430EX, but as the YN560 already flashed, the 430EX gets the signal on it´s external input and flashes just now. Maybe this is one of the reasons for the different trigger lags.